What a coincidence! This week our featured shirt just so happens to be inspired by our featured Monday charity – the Possibility Project! This shirt is called “Never Give Up” and was designed by a high school student in Beijing named Wang Liang. It’s only $15 right now so hop on over to our website to buy it! And check out the Possibility Project website if you want to get involved with their programs or attend one of their performances! Monday Charity: The Possibility Project! This week we’ll be taking a look at the Possibility Project! Originally founded in 1994, this organization first began in Washington D.C. as a way to empower teenagers to overcome the culture of violence and racial division that infected out nation’s capitol at the time. The group’s first performance was produced in that year, and the program became so popular that City at Peace-DC had to begin a second program in 1997, and soon after began to branch out to other cities such as Santa Barbara, Los Angelos, New York, Baton Rouge, Cape Town, South Africa, and even an exchange project in Israel. 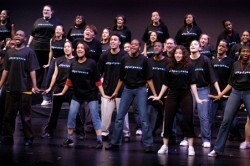 Since the Possibility Project began, their programs have engaged over 2,000 youth participants, produced 56 original musicals witnessed by over 40,000 live audience members, and created more than 60 community action projects – and they aim to continue growing in an effort to empower youths to create better lives for themselves and their communities. If you want to help get involved by joining a project or attending a show, check out the Possibility Project website! And, of course, you can always buy a Possibility Project inspired t-shirt from the Love and Water Design website! The Possibility Project is bringing young people together through inventive new methods of community outreach and the performing arts. Participants learn important skills in conflict resolution and create a shared musical theater piece based on their lives, experiences and ideas for change. The Possibility Project also assists its members in implementing change in their own New York City neighborhoods, creating a uniquely active and creative youth. This inspiring design was sent to us all the way from China by a student named Wang Liang and shows the immense potential of The Possibility Project in touching lives. Click here to read more about Wang’s inspiration and buy a t-shirt to support this very worthy (and increasingly global) cause. YOUTH DIVISION launched in April featuring The Possibility Project! It is Love and Water’s great pleasure to introduce our Youth Division featuring Youth Charities and submissions by all Youth Artists! Our first featured Youth Charity is The Possibility Project, which does some of the most transformational work with teenagers we have ever seen. Really. The Possibility Project brings together vastly diverse groups of teenagers who meet weekly for a year. Through a combination of issue-oriented discussions, trainings in diversity, conflict resolution, leadership and community activism, instruction in the full range of performing arts, and the creation of scenes and writing, the youth cast writes, produces and performs an original musical based on their lives and their ideas for change. In addition, they design and lead community action projects on issues of concern to them in order to take their creative vision for change into the world. Through the program, our young people develop skills in cross-cultural understanding, non-violent conflict resolution, leadership, community responsibility, self-efficacy, and the performing arts and achieve academic advancement. Our aim is to increase the confidence and independence of teenagers as they move into adulthood, and to create the next generation of creative leadership that is capable of unifying our diverse populations to resolve the most pressing social issues that we face. Check them out. Check out their show at the end of April. And prepare to be Inspired!